Nearly a month after the May 12 Iraqi election, final results look like they're still far away. 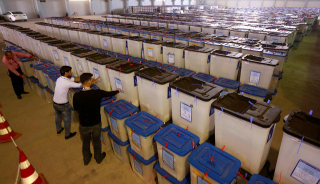 The Iraqi parliament on Wednesday announced that they are ordering a full recount of all 11 million votes cast. That, and Abadi's complaints about the Independent High Electoral Commission (IHEC) has led to parliament firing the entire commission. They are temporarily replacing the commission with a panel of judges. MPs say the recount is intended to "correct the result" of the vote, but exactly how long it's going to take to manually recount all 11 million votes is unclear. In the interim, it will be virtually impossible to try to negotiate the new government, with parties unclear how many seats they'll really end up with.